This recipe makes 2 9x5 inch pumpkin flavored loaves of bread or 1 loaf of bread and two 8 inch round pans of rolls. Mix 5 1/2 cups of flour, brown sugar, salt, pumpkin pie spice and yeast in the bowl of a stand mixer. Add the milk, eggs, pumpkin and oil and stir until mixed. Gradually add the remaining flour until dough is not too dry, but not too wet. If it seems very dry, add a tiny bit of water. Attach the dough hook to the stand mixer and knead until smooth and elastic. Put the dough into a greased bowl and let sit for 60 minutes or until doubled. Press down the dough, and turn it out onto a lightly oiled work surface. Divide it into however many sections you need. You'll have over 3 pounds of dough. 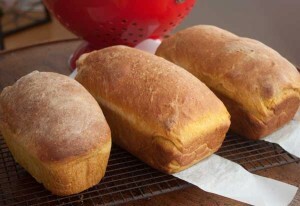 Shape dough into loaves -- two 9x5 ot two 8x4 inch loaves and a mini loaf or some rolls. Cover the pan(s) and let the loaves/rolls rise until almost doubled, about 45 minutes. Toward the end of the rising time, preheat the oven to 350°F. Bake the bread for 30 to 35 minutes, or until its crust is a deep golden brown, and a digital thermometer inserted into the center registers about 190°F. Remove the bread from the oven, and turn it out onto a rack to cool. Store completely cool bread or rolls well-wrapped, at room temperature, for several days; freeze for longer storage. loaves; or 1 loaf and 12 to 16 rolls; or 24 to 32 rolls.